We’d love your help. 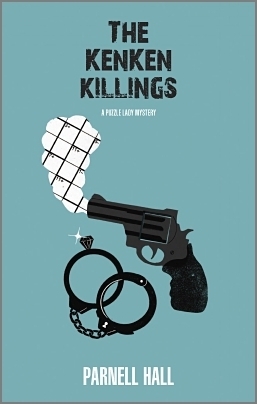 Let us know what’s wrong with this preview of The KenKen Killings by Parnell Hall. The Puzzle Lady, Cora Felton, is surprised to learn she's inherited $10,000. Of course, she doesn't even remember the man who was supposedly one of her former husbands. Turns out it's an elaborate scam cooked up by Melvin Crabtree, Cora's fifth husband, to get out of paying her alimony. But it's more than a numbers game when a banker connected to the case HER NUMBER'S UP! The Puzzle Lady, Cora Felton, is surprised to learn she's inherited $10,000. Of course, she doesn't even remember the man who was supposedly one of her former husbands. Turns out it's an elaborate scam cooked up by Melvin Crabtree, Cora's fifth husband, to get out of paying her alimony. But it's more than a numbers game when a banker connected to the case is shot to death, and a KenKen math puzzle is found next to the body. To ask other readers questions about The KenKen Killings, please sign up. Terrific, fast moving book. Funny. Interesting. Lovable characters. So glad I came across this at the library. Will be reading the rest. "The Puzzle Lady, Cora Felton, is surprised to learn she's inherited $10,000. Of course she doesn't even remember the man who was supposedly one of her former husbands. Turns out it's an elaborate scam cooked up by Melvin Crabtree, Cora's fifth husband, to get out of paying her alimony. But it's more than a numbers game when a banker connected to the case is shot to death, and a KenKen math puzzle is found next to the body. "With the puzzles coming fast and furious, Cora sifts through clues -- up "The Puzzle Lady, Cora Felton, is surprised to learn she's inherited $10,000. Of course she doesn't even remember the man who was supposedly one of her former husbands. Turns out it's an elaborate scam cooked up by Melvin Crabtree, Cora's fifth husband, to get out of paying her alimony. But it's more than a numbers game when a banker connected to the case is shot to death, and a KenKen math puzzle is found next to the body. "With the puzzles coming fast and furious, Cora sifts through clues -- up, down, and across -- while battling shyster lawyers, jaded judges and her scheming snake of an ex. Then another murder interrupts her day in court. And no matter how many different ways she adds, subtracts, divides or multiplies, the total tallies up to one scorned killer banking on revenge." There certainly is no shortage of suspects in this zany mystery. And our Cora is still her crafty, thumb-her-nose at rules and throw-caution-to-the-wind force to be reckoned with. There are a couple of unexpected developments in people's lives in this book, so if you've been following the "cast," you'll be intrigued to find out how those little subplots go. This series is just fun! Not deep, not thoughtful...it’s like literary junk food and perfectly divine once in a while. One of the Puzzle Lady's (Cora Felton) ex-husbands is in town trying to discredit her in order to sever her alimony payments. Along with him is his current girlfriend Bambi and following him is his current wife. The banker testifying against Cora is found dead as is the bank teller who also testified.... Meanwhile Kenken & related crossword puzzles are turning up...all pointing to various suspects. With her quick wit & smart mouth Cora manages to save her alimony payments and unmask the mu One of the Puzzle Lady's (Cora Felton) ex-husbands is in town trying to discredit her in order to sever her alimony payments. Along with him is his current girlfriend Bambi and following him is his current wife. With her quick wit & smart mouth Cora manages to save her alimony payments and unmask the murderer. This is Not great literature or even great writing...just a fast, easy & enjoyable read. I've read several of the Puzzle Lady mysteries. The stories are quick to read since the sentences are all fairly short and somewhat lighthearted, even while they are talking about murders. There is always a puzzle that is connected with them that provides clues about the killer. From this series, I learned about different types of sudoku puzzles. In this one, they include a new-to-me puzzle, the kenken. It is going to take me some practice to learn how to solve them, but you don't need to learn I've read several of the Puzzle Lady mysteries. The stories are quick to read since the sentences are all fairly short and somewhat lighthearted, even while they are talking about murders. There is always a puzzle that is connected with them that provides clues about the killer. From this series, I learned about different types of sudoku puzzles. In this one, they include a new-to-me puzzle, the kenken. It is going to take me some practice to learn how to solve them, but you don't need to learn in order to read and enjoy the books. As always this book was filled with word play/bickering and puzzles. It even manages to mock itself for the conventions of the series (puzzles showing up on dead bodies). But what really got me was a major plot point that is dropped once the real story gets rolling. Cora is set up by her ex husband in an attempt to stop her alimony payments. Witnesses at the hearing start turning up dead. Ken-Ken puzzles and crossword puzzles match up to give clues. Cora has to work with Becky, the town attorney, to keep herself out of jail. She also has to prove Melvin's innocence. Loved it! It really kepts me guessing until the end. I also loved the puzzles that are scattered throughout the book. I wish I had photocopied the puzzles before I went on vacation with this book so that I could have tried them myself. This book is great for anyone who liked mystery and/or puzzles. This barely rates a two out of five stars. My biggest problem is Cora. She's incredibly annoying and shallow and so it's hard to feel bad that she gets herself in quite the legal pickle. I did find out what a KenKen puzzle was and since I hate math and numbers, I'll be avoiding those in the future. I likely won't be reading this series in the future, either. I loved the introduction of the Ken-kens but I had never solved one so it took me longer to work through the puzzles in this book. I found it to a wonderful addition to the different style of puzzles. These are always fun, quick reads. The word play can be exasperating at times but I do appreciate Parnell Hall's talent for this sort of thing (although I do prefer his Stanley Hastings series). The KenKen Killings is one of the better entries in this series. I picked this up because I adore puzzles! The puzzles in the book get 5 stars. However, the content and word choice of the author won't have me reading again. I had truly hoped this would be a great new find, but I cannot in good conscience recommend this series. This may be the worst book I have ever read. Inconsistent, unpleasant characters; weak writing; gimmicky puzzles that are not well linked to the action or characters. How this series got to #12 is beyond me! Another cute Cora and Sherry story. I enjoy these light mysteries, there is good conversation with lively banter btw the characters. The characters and likable and familiar. these books are always a fun read -- lighthearted & full of witty reparte! These Puzzle Lady books are always entertaining. These books are fun for the puzzles they contain as well as the puzzle within the story line. This one was more predictable than most of the stories. another entertaining mystery by Parnell Hall - I ♥ Cora Felton AKA the Puzzle Lady and I ♥ Parnell Hall. He has a talent for writing believable, entertaining dialog. Inane. Just awful. Why do I keep reading these terrible things? Loved the puzzles....tolerated the mystery. Interesting as always! Makes me want to read other books by Parnell Hall. I always enjoy a "puzzle lady" book. They are so easy and simple to read. I love the characters, as well.